When it comes to knowing what guitar effect pedals you really need, things are not as easy as, say, choosing a piano cover, a new blues harmonica, or even a good karaoke system for home. 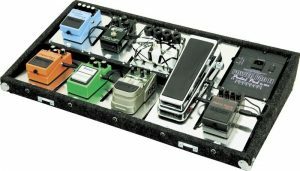 Maybe you’ve already looked at pedalboards that other experienced players use and thought that there are so many and with different names, that you’ve felt overwhelmed. Although the sound’s core comes from many different elements, it’s true that pedals can transform and shape your tone, making it more unique and personal, if you know and understand what you actually need. 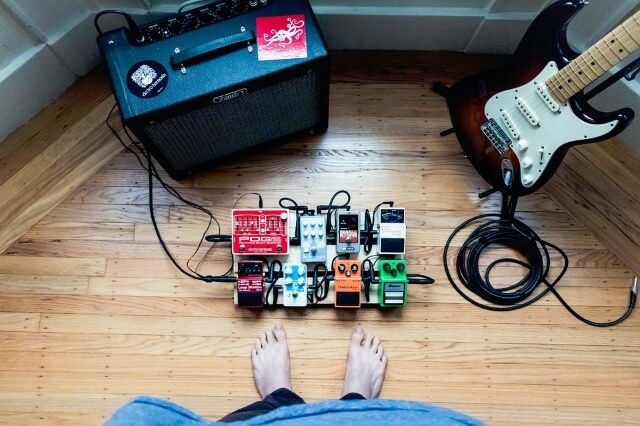 Below you’ll find a guide to help you understand what the basic pedals are and which of their characteristics you could use. This way, you’ll find your way around them much easier, and you’ll be able to make the right choice for your needs. In the end, the most important thing is to get in touch with your creative side in every way possible, so let’s not waste any more time and get into the different types of pedals that can shape your sound. It’s true that your guitar comes equipped with a volume knob, however this doesn’t mean you cannot benefit from a volume pedal as well. This element works well for various applications, such as, obviously, a pure volume for your guitar signal, but also as a master volume if you place it after the amp. The stereo volume pedal can further expand the tonal possibilities of your setup, offering more versatility and allowing you to tackle more musical ranges. 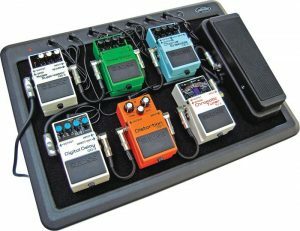 A tuner (or tuning pedal) is one of those fundamental elements for your rig, as it can also be used as a mute switch for changing guitars in-between songs. Although there are many smartphone apps these days that can help you tune your guitar, when you need precision and clear indications of the pitch of your strings, a good old tuning pedal is the way to go. Made popular by world-renowned guitarists such as Jimi Hendrix, Slash, Jerry Cantrell, and many others, the Wah-Wah effect is, in fact, a pedal-controlled Q filter. This ultra-recognizable vocal-like effect can be obtained by having a Q parameter going back and forth, this way modifying your guitar voice also known as either “opening” it or narrowing it down by removing treble frequencies. Although words cannot really describe it, this effect mimics the human voice saying the onomatopoeic name “wah-wah”, and since its inception, it has been featured on countless records. Back in the day, guitarists had to crank their amplifiers in order to obtain that nice distortion required for different musical styles. Luckily, this is no longer the case today thanks to these handy elements called overdrive pedals. With their help, you can basically drive every clean amp into overdrive. The best part is that you can do this at any volume and choose the tone’s amount of gain and shape precisely as desired. As we well know, the overdriven or crunch sounds are most commonly used for rock music or to get that “breakup” clean tone or to play blues and solos. In the last two decades, guitarists found out that overdrive pedals can also be used to boost the crunch channel of their amps into total distortion. This technique is often used during guitar solos and it gives sound that extra weight needed for specific effects that players might want to obtain. Although many people think that the overdrive and distortion pedals are pretty much the same thing, this is not actually the case. The overdrive tends to add texture to the clean tone, emulating a cranked amplifier, while the distortion intentionally distorts the waveform of the guitar signal. For this reason, the distortion pedal’s effect is much more audible and the resulting sound is somewhat harsher and louder. Sometimes, it’s completely different from the starting sound, helping the player achieve the desired tone and style. Distortion pedals work great for rock and metal players, and they can also represent a safe boat for guitarists that feel the need to have a backup to their tube amplifier. It’s very true that a distortion pedal added to the clean channel of a rented amplifier can save the day, and the gig for that matter. If you know that you’re a dynamic player who likes to play soft and loud, then a compressor is undoubtedly a must-have. By raising the soft parts and adjusting the loud parts, you can get an even sound suitable for most applications without it being discomforting. To put it in simple terms, the compressor is, in fact, an “automated” volume control. Since we’re talking about controlling your guitar’s volume, then we can take a moment and have a look at the EQ. This device is crucial if your guitar is problematic or you simply need a creative way to alter the way your guitar sounds. The good thing about it is that it can be placed in front of the amp, this way shaping the sound going inside the amp, or in the send/return (located after the amplifier section) as a volume boost, this way offering more alternatives in terms of sound and tones. Once the sound is all shaped, you might want to add some depth to it, and here’s where the ambiance pedals come into play. The important thing to know and remember about the chorus effect is that it should be used properly, without overdoing it. If you manage this, you can achieve great results since the depth and effect (that feels like three guitarists are playing your part) can work amazingly well and help you give your music the personal touch you’ve been looking for. When it comes to delay and reverb, these can be used lightly to enhance the sound and fill up any guitar solo with a little space, or heavily, to get more creative with your sounds and get to the point where there is basically no limit in terms of options.